Big Finish: JAGO & LITEFOOT, Series 5 Review | Warped Factor - Words in the Key of Geek. Gerooovy baby, says Tony Fyler. Over the first four series, Jago & Litefoot firmly established the tone of their spin-off – weird Victorian goings-on, frequently with an infernal spin, only occasionally explained as something rational. Their investigations into the dark and mysterious goings-on mixed the scientific rationalism and the spiritually mystic elements of their contradictory age, giving them a greater degree of consistent atmosphere than Doctor Who, and allowing them to get away with a good deal more in terms of the unexplained or the scientifically dubious. That’s Victoriana for you. 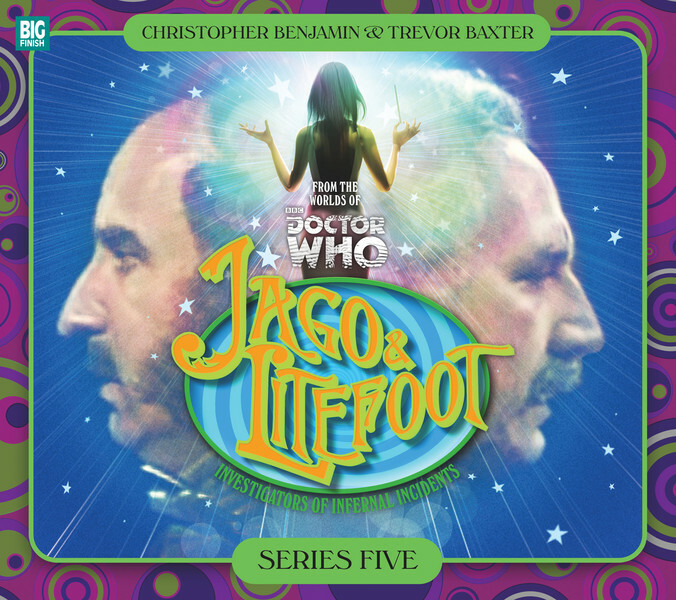 But after the Voyages to Venus and the New World with the Sixth Doctor, Series 5 of Jago & Litefoot upends everything they know by dumping our enthusiast detectives in 1968, some seventy years beyond their own age. How will it possibly work, when they’re so far out of time, separated from the gang of friends they know, who help them in their investigations? Honestly? Better than ever before. The ideas of men out of time is of course not a new one – Adam Adamant, Austin Powers (which was largely based on the Adamant premise) Captain America, and others have all explored the idea of coming to terms with, and to some extent mastering a new time and its dangers. But in the case of Jago & Litefoot, it gives the series a great new energy boost, as well as pitching them in a battle against their oldest enemy. First thing’s first – it’s a mistake to say they’re without friends in this era. Ellie Higson, the perennial barmaid at the Red Tavern in their own time has survived till 1968, for reasons which will be familiar to J&L fans. The legacy of Gabriel Sanders means she assumes in this series a certain Captain Jackery, having gone the long way round while our heroes arrived in 1968 by impetuous Tardis travel. And while Conrad Asquith takes a series off as Sergeant Quick, they’re joined in 1968 by the grandson of Litefoot’s occasional pathology-lab pal, Sacker, Duncan Wisbey playing his own descendant as Sergeant Sacker. What’s more, the comparatively egalitarian era of the swinging sixties proves the backdrop for a reversal in our heroes’ fortunes. While in the Victorian age, it’s Litefoot who’s the social success and Jago who plays second fiddle, in the late 60s, Jago comes into his own, rocketing to fame in the age of television as the master of ceremonies on a nostalgic variety show (The Good Old Days in all but name), while Litefoot, with a little investment from a friend, lives a relatively quiet life running an antiquarian book shop. It’s a violent disruption to the setting that has worked for four series, but as it turns out, it’s a thing of greatness. In Jonathan Morris’ The Age of Revolution, there’ fun to be had with the competing mindsets of the age – the long-haired hippiedom and the backlash against it from ‘proper’ people all around the UK. It’s a cogent reminder that what we think of as accepted history is only really the winning version of a complex story, while also bringing in the cult of celebrity in the person of Timothy Vee, a TV presenter in the Simon Dee mold. The further a society goes towards permissiveness grooviness, the more insane it will make uptight people (if we needed real-world proof of that, we needed only to watch the Republican Presidential Candidates debate). There’s a thorough lesson in that dynamic at work in The Age of Revolution, and it’s to their credit that Jago & Litefoot, despite being on the wrong side of time, are on the right side of history. When you get a Marc Platt script, you can bet it’s going to be idea-rich, and not a little barking. So it proves in the second story in this series, The Case of the Gluttonous Guru. Eastern mysticism, hallucinogenic frog-licking and Jago as the carrier of a goddess’s young are just a handful of elements in play in this one, and the pacing is more comedic than dramatic, but if you thought the giant rat of The Talons of Weng-Chiang was impressive, you ain’t heard nothing yet. But it’s when we get to Colin Brake’s story, The Bloodchild Codex, that things hunker down for a serious story-arc, with the curious Guinevere Godiva (oh yes, the trend towards deliciously daft naming conventions continues into the late sixties) played with aplomb by Raquel Cassidy, and the mysterious Summer getting entangled in shenanigans revolving around a very peculiar book. It’s solid gothic horror, this one, with melting people, a bit of Harry Potterism (you won’t fail to notice it when it happens) and perhaps a rather convenient and simple ending, given the twists and turns it takes to get there. Without spoilering you absolutely rotten, it’s difficult to know what to say about The Final Act by Justin Richards. Suffice it to say that if you like Jago & Litefoot enough to buy their audio adventures, you’re probably a fan of The Talons of Weng-Chiang. And if you like The Talons of Weng-Chiang, you’re going to need to listen to The Final Act. I mean really, need to. Because you probably thought the story was finished, didn’t you?